Happy New Year 2017 to all Captivate users! (user thinking that Captivate is just a Powerpoint clone). For those reasons I suspect it is Time to update that old article, to explain the ins and outs of the Timeline panel including features like CPVC-projects and slides, Effect Timelines, Drag&Drop, which were added in more recent versions. 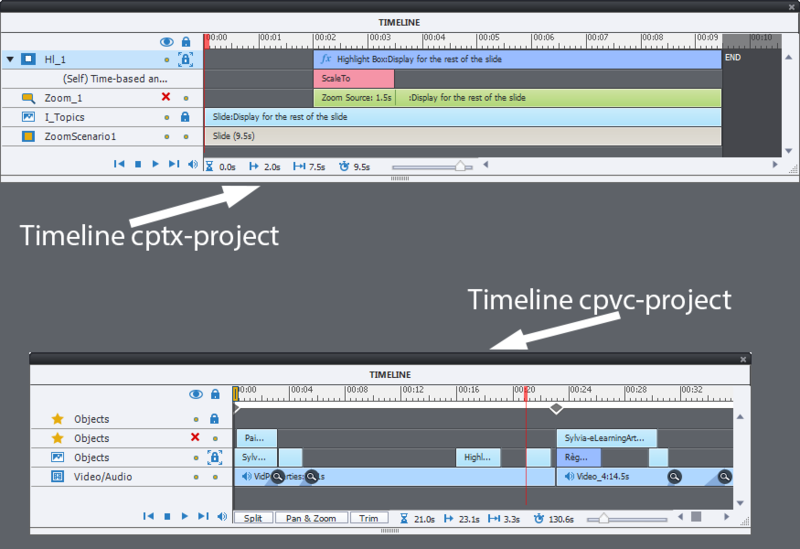 Timeline panel, in collaboration with the Timing Properties panel is at the core of the Captivate application(s). Personally I’m persuaded that it should be a top priority in the skills-set of any Captivate developer, whatever its level. Since I cannot offer you a ‘digestive’ (limoncello, grappa, schnapps, single malt…) I will split up this (broad) subject in several articles. You are reading the introduction. Following posts will treat the topics: ‘Timeline in a cpvc-project’, ‘Timelines in a cptx-project (master slides and normal slides)’, ‘Color coding and Shortcut keys for Timelines’, ‘Why/how to pause a timeline?’. Why do you need a Timeline? Many users talk about the output of a Captivate project as ‘a movie’. Although this is only completely true for a file published to a video format (MP4), this indicates well that Captivate is related to video applications like Premiere Pro and After Effects. No one will have doubts about the importance of ‘time’ for video. A movie has a playhead, which moves at a certain speed. That speed is usually indicated by the term ‘frames per second’, or FPS. Frames remind me always of the traditional way of producing cartoon movies: each frame, drawn by a graphic artist, was slightly different from the previous and the next frame. By playing those frames at a certain speed, movement could be simulated: the slowness of our eye/brain made it possible to see fluid movements from those frames. Captivate has two types of ‘raw’ files: the cptx-files (slide-based) and the cpvc-files (less-known, Video Demo files). Both types have a Timeline panel but with some differences as I will try to explain in this post. Let us start with those features that can be found always in the Timeline. If you prefer watching an interactive Captivate (slide) tutorial instead of reading static text click on this link. This portal only allows passive media until now (image, audio, video). The detailed screenshots below are taken from these two timelines, the upper timeline is from a cptx-project (slide-based) and the lower timeline is from a cpvc project. Contrary to some video or animation applications, the Timeline ruler in Captivate is always in Time units (seconds), cannot be changed to frames (look at the horizontal ruler in the top of the Timeline panel). The smallest increment in the timeline is 0,1 seconds. With a default rate of 30FPS (which can be changed) 0,1seconds = 3 frames. The Playhead is represented by a red rectangle. When you use the play button in the control panel (see 4), you’ll see its movements. You can also drag the Playhead to a certain position on the timeline. There is a slight difference in size for the playhead in the cptx project (upper screenshot) and the cpvc project (rectangle is smaller). Next to the Eye button is a Lock button, with similar dots for each track. When you click the button at the top, all objects on all tracks will be fully locked. Fully locked means not available for selection, nor for editing any property. However, if you click a dot next to a track, there are two states. The first state is activated after the first click: it will lock only size and position, but you can still select and change the other object properties. In the screenshot for the cpvc project, the Objects track just above the Video/Audio track is in that state. Look at the arrow indicators around the Lock symbol. Same for the uppermost track in the cptx-project (Highlight box). Clicking a dot twice results in fully locking, no selection is possible, no editing of any property. This is the case for the top track in the cpvc-project, and for the Zoom object in the cptx-project. Watch the look of the lock icon. The Control panel at the bottom of the first column (see screenshot below) has the classical (video) buttons, from left to right: ‘Move Playhead to start‘, ‘Stop‘, ‘Play‘, ‘Move Playhead to the end‘. Play and Stop can also be activated with the space bar if the timeline panel is active. Warning: Play Slide under the button Preview has the same function as Play in this control panel. Although it is under the Preview button it is NOT a preview at all! It is just meant to be used for editing, will not show how the slide will look after publishing. This is a common misunderstanding.The last button on the control panel: ‘Audio‘ is a toggle, will mute/unmute Audio when watching using the Play button. Like the Eye button, this will not affect audio when publishing. The state of this button will apply to all open projects. You see the muted state of that button in the screenshot for the cptx-project. Hourglass icon: indicates the location of the playhead from the start of the track; its tooltip is ‘Elapsed Time‘; this indicator is always available, even when no track nor object is selected. The Zoom slider to the right of this total duration, allows the timeline to zoom in/out. Specific features of timelines in a cptx-project (master slides and normal slides): All you have to know…. Sorry to disagree, but I never miss the oninon skin (know perfectly what you mean). It is very useful for long timelines, but Captivate’s design is meant to be used with shorter timelines, since the transition between slides doesn’t have to be visible to the user. What do you mean by ‘timing things is just plain whacky’? I find it pretty easy with shortcut keys, and using short slides. Did you read the article about shortcut keys in the timeline? I inherited some slides with complex timeline based animations and interactions and not being able to see the timeline in the same way that Flash or AE or numerous other timeline based animation tools work was tough. Since then I have been dividing more complex slides into multiple slides and it has been almost a non-issue. I would still like to be able to shut this on and off so that you only see what is under the playhead at all times. Would be a nice to have! See everything on the timeline when you are not scrubbing is akin to an onion skin. This would be a great feature if you could shut it on and off. Hoping this is on the Captivate Development teams radar because it is badly needed. Timing things is just plain whacky as it is now. Having said that there is a lot in Captivate to appreciate! Be sure to check out the other 4 articles: 2 of them are already published, 2 more to come. Great, in-depth look at the Timeline and the critical role/functions it plays. I use it all the time and can’t do certain things easily without it. This article is a keeper! The Timeline is one of the most powerful features in Captivate, but only if you really understand how it works. Thanks Steve, in any Captivate training I always spend a lot of time explaining the Timeline. It couldn’t be done in one article, 4 more are ready for publishing! Hope that this will help some Captivate users. You’re welcome. More to come, there is so much to tell about the Timelines. What a great in depth look. Thanks!